Designed in by international renowned architect, Rafael Vinoly, the DLCC was the world’s first LEED Platinum-certified convention center when it opened in 2003. 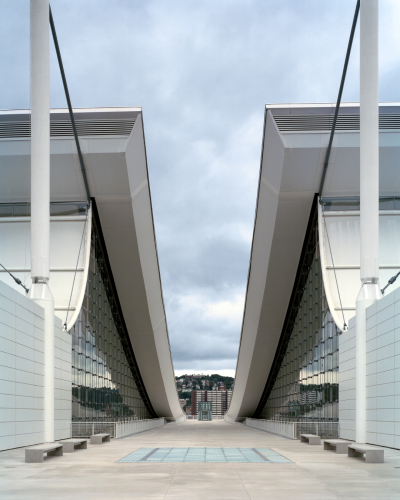 It drew structural inspiration from Pittsburgh’s bridges to create a suspended roof with a rising contour that supports passive ventilation in a vast, column-free space. Visit the roof for amazing views and artwork on display. What began as a vision by a group of determined government in 1990, corporate and non-profit foundation leaders became a reality in September 2003 with the official dedication ceremony of the David L. Lawrence Convention Center. The opening of the 1.5 million square foot building was so anxiously anticipated by the convention and exposition industry that the building hosted many large trade shows while still under construction. David L. Lawrence Convention Center, showcases twenty-five works of art which celebrates the City’s diversity.